This amazing chocolate sauce is not a newbie on my blog. On the contrary, it has been accompanying my pancakes for months now. However, I thought something as tasty and simple as this chocolate sauce deserves a separate blog post and even a video (see below) to show you that it actually is super quick and easy to make. This is one of those recipes that just happened –I didn’t spend hours or days planning or experimenting to get it right. I just quickly mixed it together while baking another stack of my pancakes. I had a craving for chocolate sauce and threw a few ingredients in a small bowl and voilà! The fact that this chocolate sauce recipe is oil-free doesn’t mean that it’s also low fat food as 45% of its calories still come from fat. So, it’s not the kind of dessert you’d spoon down at one go without any regrets. 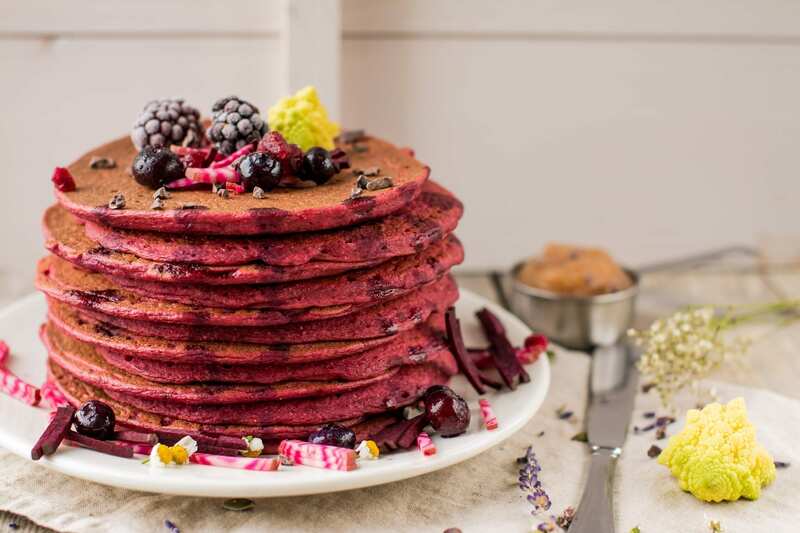 However, when you spread about 5 grams (which is enough in my opinion) onto one of my vegan oil-free pancakes, you’d only get 17% of calories from fat. 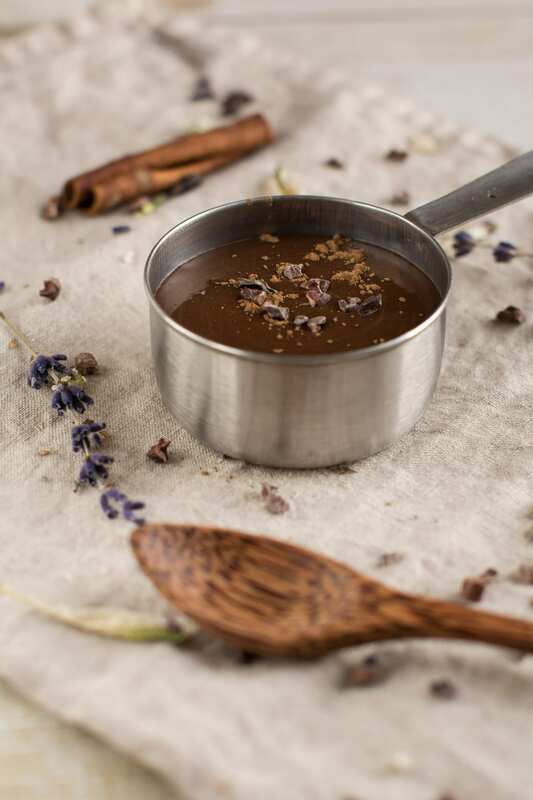 So, when eaten mindfully this chocolate sauce is a much-much healthier alternative to the commercial varieties that contain preservatives, added sugars and oils. 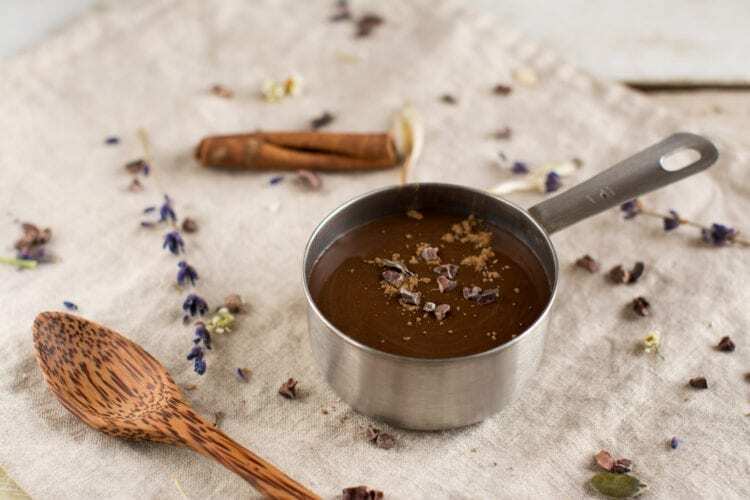 The sweetness of this chocolate sauce recipe exclusively comes from carob and plant milks and is just perfect for me. Should you not be used to natural sweetness, add a bit of sweetener (stevia or xylitol if you are on Candida diet) in the beginning and cut it down gradually as your taste buds adjust. My quick and easy chocolate sauce is vegan, whole food plant-based, oil-free, sugar-free, and gluten-free as well as Candida diet friendly. In a small bowl whisk together the solid ingredients with coconut milk and 1 tbsp. of plant milk. Add 2nd tbsp. of plant milk and mix well again until well incorporated. Avoid any lumps. Finally add the 3rd tbsp. of plant milk and mix until you have a creamy sauce. You’ll get around 90 grams of this delicious chocolate sauce, i.e. enough to serve with 18 pancakes. Store in sealed container in fridge for up to a week. For different flavours, try using other nut/seed butters or a mixture of them, i.e. cashew, hazelnut, almond, peanut or even sunflower. 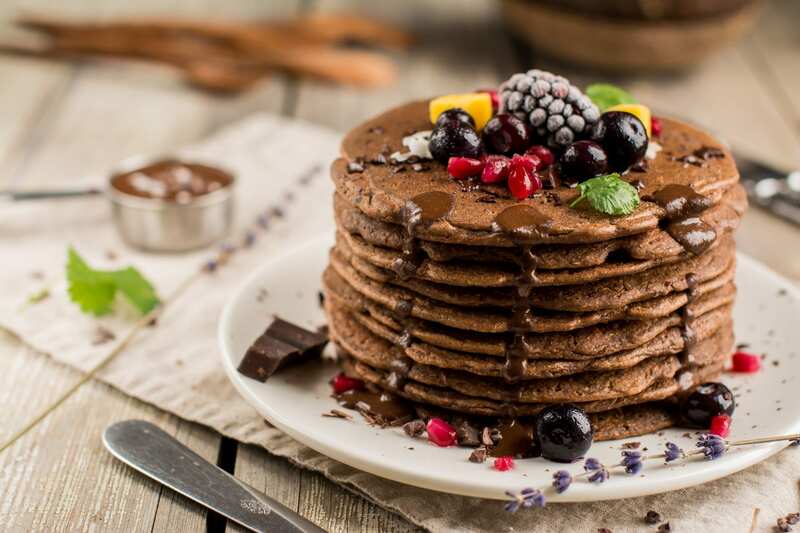 Can you use all cacao/cocoa instead of carob and some stevia and still have it be for anti-candida diet? It depends on which stage you are at. If you can tolerate cacao, go ahead and sub the carob. If cacao still is not OK with you, sub it with carob. 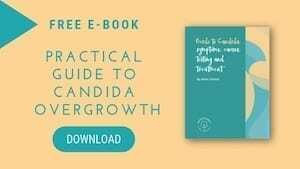 Stevia is fine on Candida diet.